BLOOMINGTON, MN – MatrixCare®, the largest long-term, post-acute care (LTPAC) technology provider in the United States and perennial winner of the coveted Best in KLAS award for Long-Term Care software, has been selected as National HealthCare Corporation’s enterprise EHR platform partner. MatrixCare will initially be rolled out to all National HealthCare Corporation (NHC) corporate and skilled nursing locations across its regions of operation. NHC has a long-standing track record of success in providing high-quality care through a broad spectrum of large-scale LTPAC services. However, as the organization looked forward, it determined it needed to upgrade its information technology capabilities to be able to continue its track record of success as the industry shifts to fee-for-value reimbursement. NHC joins the growing list of leading LTPAC providers upgrading to MatrixCare to take advantage of better interoperability, better ease of use, better analytics, better service, better long-term vendor stability, and better outcomes performance. 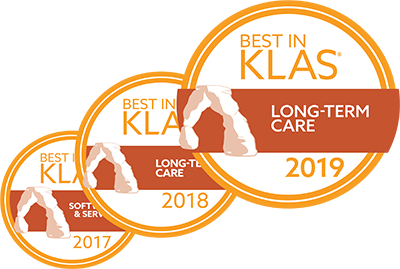 Current and multi-time winner of the prestigious Best in KLAS for Long-Term Care Software award, MatrixCare is the complete solution for growing organizations that need to successfully manage risk in care delivery across the LTPAC spectrum. Trusted by more than 13,000 facility-based care settings and more than 2,500 home care, home health and hospice organizations, MatrixCare’s solutions help ACOs, skilled nursing and senior living providers, life plan communities (CCRCs), and home health organizations to connect, collaborate and prosper as we migrate to a fee-for-value healthcare system. In addition to purpose-built EHR components for any LTPAC care-setting, MatrixCare also includes solutions to systematically increase clinical quality: Enterprise Analytics, robust Clinical Decision Support and the industry’s first Care Coordination platform to create a true, person-centric, e-longitudinal health record and enable LTPAC providers to efficiently manage the populations under their care. Visit www.matrixcare.com and www.carecommunity.com for more information. NHC affiliates operate for themselves and third parties 76 skilled nursing centers with 9,623 beds. NHC affiliates also operate 36 homecare programs, five independent living centers and 24 assisted living communities. NHC’s other services include Alzheimer’s units, long-term care pharmacies, hospice and a rehabilitation services company. Additionally, NHC affiliates provide financial and accounting services to 17 skilled nursing centers with 2,667 beds and three assisted living centers. Other information about the company can be found on our web site at www.nhccare.com. NHC common stock is traded with the symbol NHC on the NYSE-American Exchange. National HealthCare Corporation is recognized nationwide as an innovator in the delivery of quality long-term care. Our goal is to provide a full range of extended care services, designed to maximize the well-being and independence of patients of all ages. We are dedicated to meeting patient needs through an interdisciplinary approach combining compassionate care with cost-effective health care services. The National HealthCare Corporation environment is one of encouragement and challenge … innovation and improvement … teamwork and collaboration … and honesty and integrity. All NHC employees are committed as partners, not only to the health of our patients but to the well-being of the communities we serve.